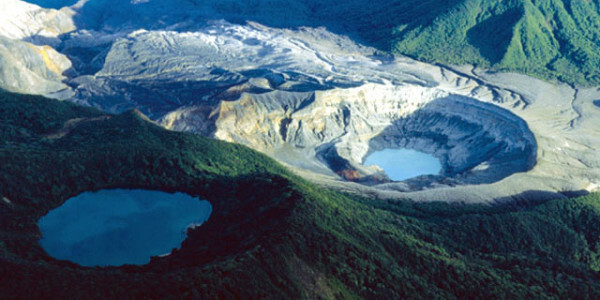 Poás Volcano is one of the major attractions in the Central Valley region, one of the most visited national parks, and a great day trip add-on for any Costa Rica vacation itinerary. 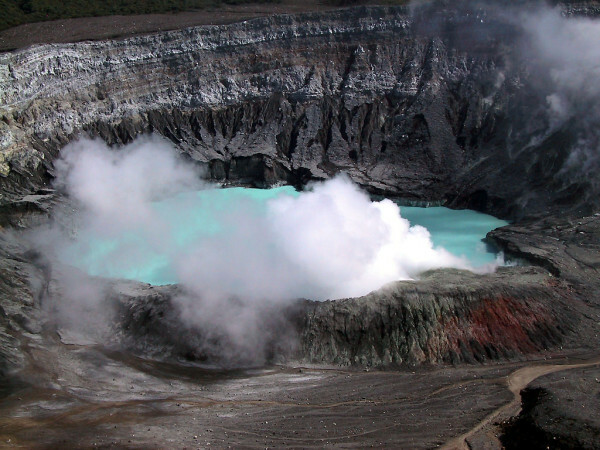 Poás volcano is a powerful symbol of the geothermal forces that formed Costa Rica. When the mist and clouds part you’ll see the sulfuric, bubbling, green rain fed lake at the bottom, surrounded by smoke and steam rising from fumaroles. Water from the lake is constantly seeping through cracks in the hot rock, evaporating and building pockets of steam. When the pressure in these pockets exceeds the weight of the water above, the steam breaks through in geysers that rocket up to 820 feet (250 meters) high. Don’t worry about getting a shower though, the crater is 1,050 feet (320 meters) deep. At almost a mile (1.6 km) across it’s also the largest active crater in the world. A modern visitors center (wheelchair accessible) and small museum explains and interprets the geothermal and ecological attractions in the park. A cafe serves coffee and hot drinks—as much to wrap your hands around to warm them as anything else—sandwiches, and snacks. Poás is active, but don’t expect to see a full fledged eruption or even any lava flow here, the most recent period of eruptive activity ended in 1954. The last major activity was in 1910 when nearly a million tons of ash was ejected along with an immense column of smoke and steam.The volcano provides an excellent if extreme example of the effects of acid rain. Around the caldera, and for several miles downwind, the vegetation is stunted brown and black by the tainted moisture that precipitates from the omnipresent clouds near the peak. Trails that lead through cloud forest stunted and twisted, not only by volcanic emissions but the rigors of the cold windy high altitude habitat. 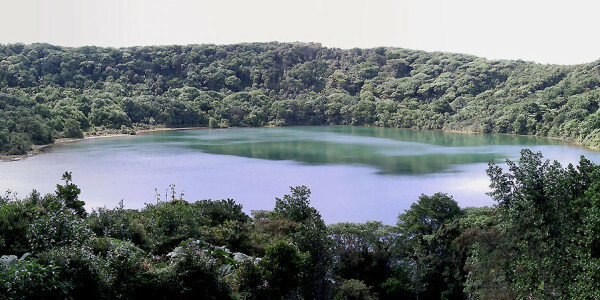 Lake Botos fills an extinct crater at the end of one trail, and is home to many cloud forest birds including hummingbirds, tanagers, flycatchers, toucanets, Costa Rica’s national bird the clay-colored robin, and the area’s most famous avian resident, the resplendent quetzal. “Maximum Staying 10 minutes” – get your picture and get out. The paved, level, 0.3 mile (0.5 km) crater overlook trail starts at the visitors center and takes about 15 minutes each way. There is a viewing platform surrounded by a short wall. 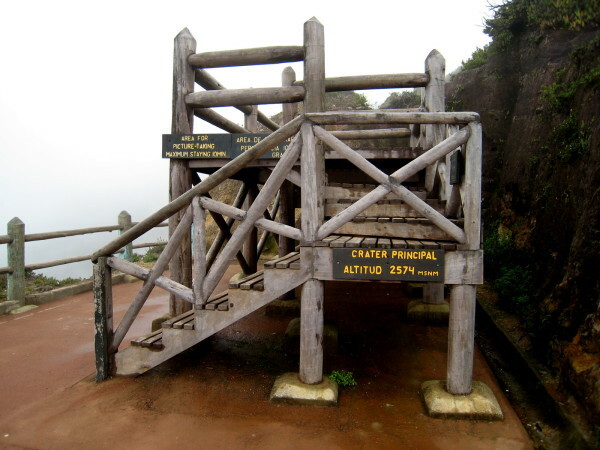 The Botos trail, 0.9 miles (1.4 km) branches off the overlook trail just before the viewing platform and climbs gently to the lake. The 0.6 miles (1km) Escalonia cloud forest trail is an excellent route to see all of the birds that live in the park, and two of the endemic species—Poás squirrels, and escalonia trees easily identified by their unique pagoda shape. Nearly constant winds and saturating humidity contribute to biting cold at the rim.